Introducing the new 7000 series, truly the Revolution of the species! The 7000 series can literally handle almost anything you throw at it. 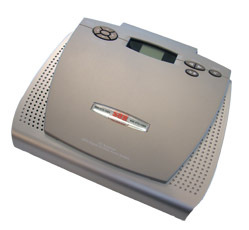 Whether you have your on-hold audio on a regular audio CD, SD memory card, or on your PC, this system can do it all. And, like all of our other systems, it’s very easy to use! Just drop in an audio CD, close the lid -- the 7000 series player spins up the disc and records it into the units built-in 128MB of digital flash memory. Want more time? Simply slide in an SD card (any retail SD card will do). With a 1GB SD card, you can have over 70 hours of audio content. Continuous playback begins immediately. Select a specific track or play all tracks in memory, the choice is up to you. CD-7000 series players come pre-loaded with nearly 3 hours of licensed music and messages, so it’s ready for use right out of the box. Like all CD-products, the CD-7000 is easy to install. Click here for more instructions on installation.